New to this forum but have been working on old cars since young. 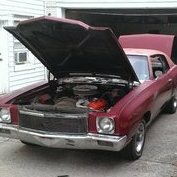 What brings me here is my father has a 72 monte that he bought from a friend of mines. My friend had to let the car go at a loss because his wife thinks these cars are "ugly". She made him buy a honda to "restore". I need not say more. My dad is in his 70s and doesnt want to fully retire and still works. I took it upon myself to fix up the monte so he can enjoy it and also because I lost my wife 11 years ago and just lost my daughter 2 years ago. Yo say iam depressed is an understatemnt. so here goes the story with this car. This is what I have done so far. repaired some floor patching that was previously repaired with aluminum sheet metal and rivets. I welded in some patch pieces frony and back in the floorpans not too bad. the roof was vinyl and of course they go like swiss cheese so it was fixed at some shop, not the way i wanted but it will have to suffice for now. the front suspension, I did tubular a arms all around with BMR springs and Konis adjustable shocks. car rides so good. not floaty at all which my dad likes. its got a firm taught ride but not jarring. mid way thru the on-IMG_0969.HEICgoing restoration, i find out the cars vin and registration doesnt match and that got me scared to hell .my friend i guess did not check his papers correctly when he originally bought the car down in Maryland in some farm. Well to make a long story short i had the vin corrected to the title by way of a mechanics lien. what i am working on now is i am converting the car from split bench to bucket seats. i was able to find a pair on craigs that seemed like they were pulled out from the cargo hold of the titanic but I refurbushed almost everything that pertains to the seats. i found a floor shift column, shifter and now need the console from OPGI along with cable and modified shift lens, detent plate to work with the 200 4R transmission i found from a monte carlo ss. Next summer i want to "Magnet Paint" the chassis, I like this paint over POR-15 and I can usually find it locally in any body supply shop. If anyone has rims for sale and are relatively close to the NYC area shoot me a message. I have more pictures of the seat reupholstery if anyone needs. Hope to interact here often as i want to finish the car for him hopefully so he can drive it for next summer. biggest thing I want to do now is the seat conversion once i buy the required bucket seat adapters, console and installing the 200 4r. The site was down for about 2 days so any duplicate error on the pictures, i am sorry. Hi Pops71! Welcome to the club! There are a few of us in the NYC area. Glad to see you saving another 1st Gen from the clutches of rust. Sorry for you loss. What type of rims are you looking for? I noticed in your pics that you don't have a long enough fan shroud. I have a small block Monte Carlo shroud in stock. Pm me if you like. Sorry for your loss. It looks like you are making good progress on the Monte. Car looks to have a great start. Ask a lot of questions, I know I still do!!! angle of the picture. It is huge, looks like the Holland tunnel. Where abouts i NY? Sorry the site has been down on and off and i was just able to get in as of now. They are working on it. Hi Geo. I'm in Staten island. I don't believe it's the angle. The 1st Gen Monte Carlo fan shroud is alot smoother. The shroud from the radiator toowards the fan for a small block car measures around 13". The fan blade itself should be halfway into the shroud and half out. Definitely a wind tunnel. Lol. 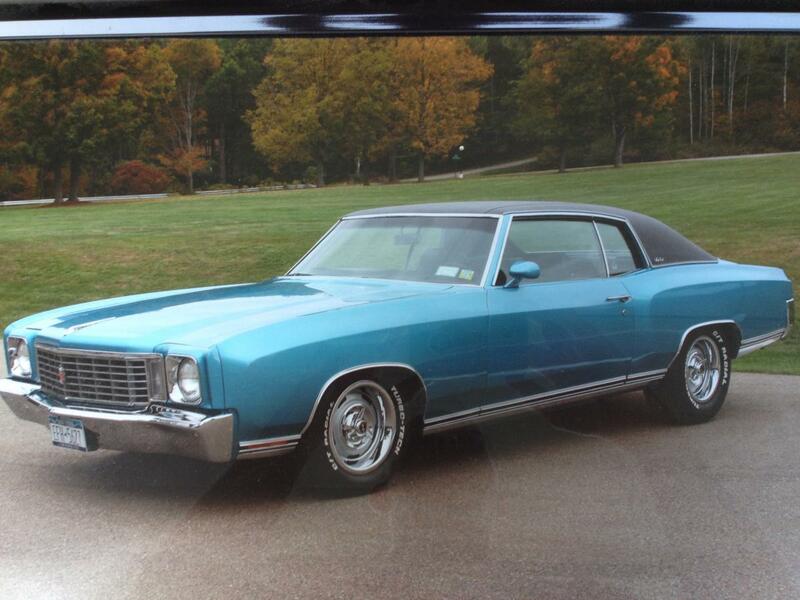 The pic is of a 72 small block Monte Carlo. Nice. I will check today and snap a picture. The car is a 71 but the previous owner made it look like a 72. I am trying to maybe find someone that would like to trade front end pieces with me. I want it to look like a 71 again. These pictures were meant to be attached to the top post but since the site is having issues, i decided to post them here. I reupholstered these seats by myself. pretty easy if you ask me but at first i was a little overwhelmed but nothing too complicated. kept me busy. Geo, nice work! Pm me. I most likely can help you make your 71 look like a 71 again. Welcome ,great thing that you are doing for your dad. Lots of helpful and knowledgeable people on the site. I'm also in N.Y. Welcome aboard from upstate N.Y. up here in snow country. Mine is tucked away for the winter now. I'm sorry for your losses, I lost my wife almost 13 years ago to cancer so I do know how that part is anyhow. Wow i am sorry for your loss. yeah I lost her to cancer as well, terrible disease. She left me my precious daughter and now shes gone too. Me and my daughter would ride all over NY state. Our last trip was exactly 2 years ago a few weeks before she passed away. we drove 1,200 miles through NY state. thank you for the warm welcome. Thanks. Trying to stay busy when I have the drive to do so. thank you. been trying to respond to you guys but the site has issues that they are working on. so sometimes i am able to log in and respond and sometimes the site is "not found"
Welcome to the madness! I'm also from upstate(wine country ) , New York. Looks like a good start on a project. reminds me of the Monte I drove in N.C. back in the mid '80's. You did a nice job with those buckets. wondering if that shroud came out of a Gran Prix? I’m having the same intermittent issue. Welcome from Long Island....there's a bunch of us out here. Sorry for your loss. Your project looks like a nice one and is coming along great!!! Thanks steve. nice Monte. are those 17"-18" rallys? If i dont respond that means I cant log on. PM sent yesterday. Hop you received it. Welcome. I sorry for you losses. Nice job on getting your Monte together. I’m out on Long Island too. As Steve has said there are quite a few of us and we’re active out here. Fellow FGMCC and Monte owners are always welcome. Geo, Welcome aboard the boards. We hope you like what you see here and decide to become a full fledged member of the club and attend some of our meets and mini-meets and really get to know some of our great members. Sorry for your losses. You are doing a great job on the car. Those seats look amazing. Feel free to hit us with as many questions, we love a challenge. Please keep the pictures coming because we REALLY LOVE pictures. Hey Geo, welcome to the club! I'm right here in Queens. Nice project you're working on, keep us updated. Buckets in these cars had the plastic chrome trim on the back panels but not the skirts. Site was down for me yesterday. Here are a few pics.